Black holes are weird: insanely dense objects that are crammed into such a small space they cause space-time to distort and the laws of physics to break down into a singularity. Fortunately, the Universe shields us from this weirdness by wrapping black holes in event horizons. But now, physicists say they’ve found a way we could detect something even more extreme – a naked singularity – and most likely bend the laws of physics in the process. “A naked singularity, if such a thing exists, would be an abrupt hole in the fabric of reality – one that would not just distort space-time, but would also wreak havoc on the laws of physics wherever it goes and lead to a catastrophic loss of predictability,” explains Avaneesh Pandey for IB Times. If that sounds a little too confronting, don’t worry, this whole study is purely theoretical, and is hinged on one very big assumption – that naked singularities actually exist in our Universe, something that scientists have never confirmed. But according to Einstein’s theory of general relativity at least, and our best computer models to date, naked singularities are possible. So, what are they? A singularity can form when huge stars collapse at the end of their lives into regions so small and dense, physics as we know it fails to explain what could happen there. There are two general laws of physics that govern our understanding of reality: quantum mechanics, which explains all the small stuff, such as the behaviour of subatomic particles; and general relativity, which describes the stuff we can see, such as stars and galaxies. When applied to singularities, both these schools of thought predict different and incompatible outcomes. And we’ve never really had to deal with that conundrum, because all the singularities we know of are inside black holes, wrapped in an event horizon from which not even light can escape – or at the very birth of our Universe, shrouded by radiation we can’t see past. Out of sight, out of mind, right? But naked singularities are theoretical singularities that are exposed to the rest of the Universe for some reason. Below you can see an illustration of a black hole wrapped in its event horizon (dotted line) on the left, and a naked singularity on the right. The arrows indicate light, which would be able to escape a naked singularity, but not a black hole. Assuming they do exist, the big question then is how would we be able to distinguish a naked singularity from a regular black hole, and this is where the new study comes in. Researchers from the Tata Institute of Fundamental Research in India have come up with a two-step plan based on the fact that singularities, as far as we know, are rotating objects, just like black holes. According to Einstein’s theory of general relativity, the fabric of space-time in the vicinity of any rotating objects gets ‘twisted’ due to this rotation. And this effect causes a gyroscopic spin and makes the orbits of particles around the rotating objects ‘precess’, or change their rotational axis. Based on this, the researchers say that we could figure out the nature of a rotating objects by measuring the rate at which a gyroscope precesses – its precession frequency – at two fixed points close to the object. 1. 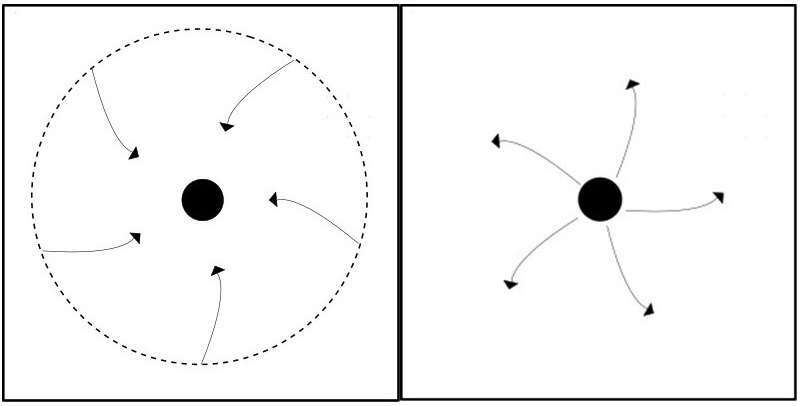 The precession frequency of the gyroscope changes wildly between the two points, which suggests the rotating object in question is a regular black hole. 2. The precession frequency changes in a regular, well-behaved manner, indicating a naked singularity. Obviously getting a gyroscope close enough to a black hole to perform these experiments isn’t exactly easy. But that’s okay, because the team has also come up with a way to observe the same effect from here on Earth – measuring the precession frequencies of matter falling into either black holes or naked singularities using X-ray wavelengths. “This is because the orbital plane precession frequency increases as the matter approaches a rotating black hole, but this frequency can decrease and even become zero for a rotating naked singularity,” the team’s press release explains. Again, we have to make it clear that all of this is wildly speculative at this time – we have never found any candidate naked singularities, and we’re only just beginning to truly understand regular black holes. It’s also worth noting that last week, another team of researchers suggested that even if naked singluarities exist, strange quantum effects could keep them hidden from us. So there’s definitely no consensus right now on whether we’ll ever get the chance to study naked singularities. And that’s not a terrible thing for now, because are we really ready to observe what goes on at the edge of our Universe? Maybe, in our lifetime, we’ll find out. The research has been published in Physical Review D.